Summer Employment – Completing the W 4 | Hunter Consulting, Inc. It is that time of year. Your child is home from college or your high schooler is going to get a job for the summer. Whatever the job is your child is getting the child’s employer will have them complete some forms so they can get paid. These forms may be foreign to your child when they see it for the first time. The forms will ask them to fill out the number of allowances they are declaring for payroll purposes. As you may be aware an allowance is used to calculate how much tax should be withheld from a paycheck based upon the filing status. For your child, assuming that their total income including wages, interest, dividends, capital gains etc. will not exceed $12,000 for all of 2018 it is not necessary to have any income tax withheld on their wages. When completing the IRS W-4 complete boxes 1 through 4 and then go to box 7 and write EXEMPT. Sign and date and give to the employer. This will prevent any Federal income tax to be withheld. Social Security and Medicare taxes will still be withheld. For New Jersey residents, if your total income will be less than $10,000 (including interest, dividends, capital gains, etc. 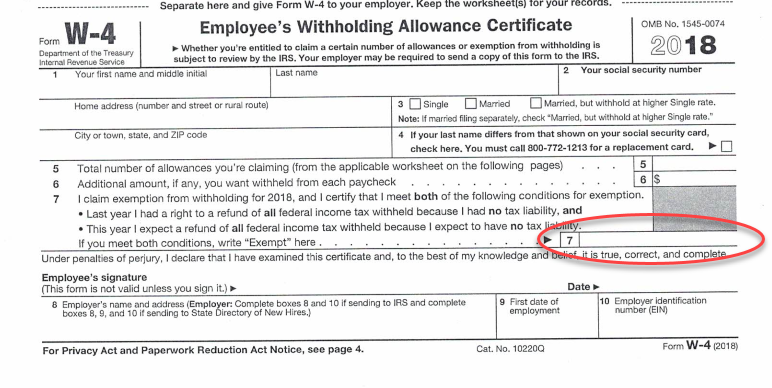 in addition to wages) you should complete a form NJ – W4. Complete box 1 and 2 and then skip to box 6 and write the word EXEMPT. Sign and date and give to the employer. Once again income tax will not be withheld but other New Jersey payroll taxes (Unemployment, Disability and Family Leave) will be withheld. If you have any questions, please feel free to contact my office for assistance.